Super Savings Item! 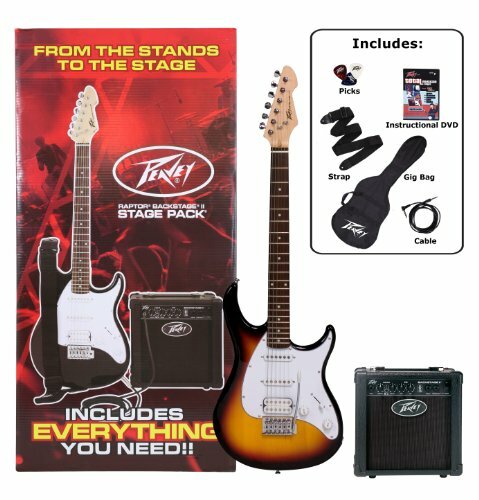 Save 34% on the Peavey Raptor Plus Electric Stage Pack, Sunburst by Peavey at Way North of Nashville. MPN: 3585380. Hurry! Limited time offer. Offer valid only while supplies last. That's right, the Raptor Stage Pack now includes the Total Musician Series instructional DVD that's designed to get beginners playing quickly. That's right, the Raptor Stage Pack now includes the Total Musician Series instructional DVD that's designed to get beginners playing quickly. Everything needed to start playing is included; Raptor Plus guitar, Trans tube Backstage amp, nylon gig bag, tuner, strap, extra strings, cable and picks.